Accessories: Accompanied by Rolex guarantee stamped by the retailer Luciano Franz, Udine and dated November 14, 1981, product literature, presentation box and outer packaging. Provenance: Rolex Daytona "Lesson One" 50 exceptional examples of the world's most celebrated chronograph wristwatch, Christie's Geneva November 10, 2013: Lot 24. Rolex Daytona "Lesson One" 50 exceptional examples of the world's most celebrated chronograph wristwatch, Christie's Geneva November 10, 2013: Lot 24. Rolex introduced the references 6263 and 6265 in 1969 as the successors to the first Oyster Cosmograph, the reference 6240. These upgraded tool watches came with new screw down pushers, an upgraded crown and movement - the caliber 727, and offered enhanced water resistance to 50 meters. Preserved in excellent condition, this reference 6263 displays a stunning dial that has changed over time from black, to a harmonious and rich chocolate brown tone, contrasting against the white graphics. It is remarkable how the dial has aged in such an even manner. Furthermore, the case is preserved in stunning condition, with sharp satin finishes on top of the lugs and crisp edges. A second-generation example, it’s fitted with original Mk 2 pushers and features a ‘three-liner’ dial displaying “Rolex Oyster Cosmograph” which is correct for the 3.36 million serial number. 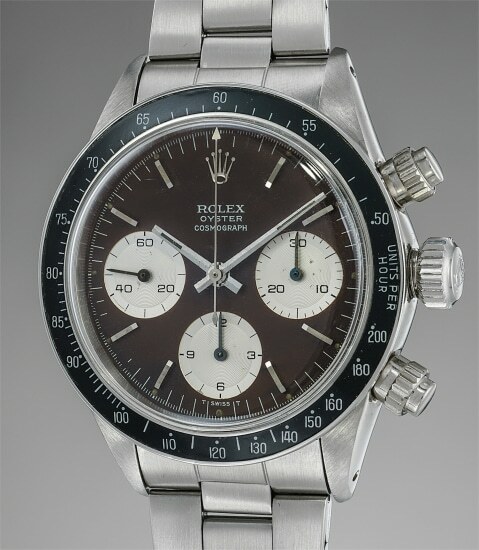 Its provenance is particularly noteworthy as the present timepiece was sold at the historical thematic sale, Daytona "Lesson One".